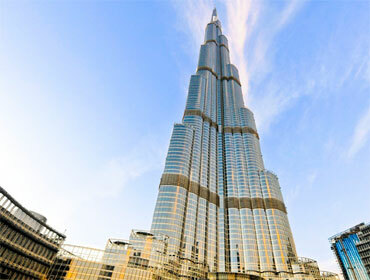 At 828 meters in height, Burj Khalifa in Dubai is the tallest freestanding building in the world. Among many other things, the 160-floor building includes the worlds highest pool (on the 78th floor) and the world’s highest mosque (on the 58th floor). Alfa Laval heat exchangers were selected for the HVAC, plumbing and swimming pool applications. The cooling system includes an innovative solution based on a thermal ice-storage facility that produces tons of ice slurry during off-peak hours. Using Alfa Laval plate heat exchangers, the ice slurry, built up in a tank, store the cooling energy that is later released, through the pipelines, to the entire indoor air conditioning and tap water systems. Apart from giving substantial energy savings, the ice storage solution also requires only a fraction of the space needed by conventional cooling equipment. In the case of the huge Burj Khalifa, this is a major consideration. Plate heat exchangers installed for air-conditioning, tap water cooling and swimming pool applications. In a large scale system, even small energy losses along the distribution chain generates heavy annual costs and must therefore be kept at a minimum. The cooling system includes an innovative solution based on a thermal ice-storage facility that produces tons of ice slurry during off-peak hours (at night). Using Alfa Laval plate heat exchangers, the ice slurry, built up in a tank, store the cooling energy that is later released, through the pipelines, to the entire indoor air conditioning and tap water systems. Apart from giving substantial energy savings, the ice storage solution requires only a fraction of the space needed by conventional cooling equipment.